Jointed style, wood body, soft tail, visual crank bait potential with big bait style looks. Attracts fish from down deep with body vibration. 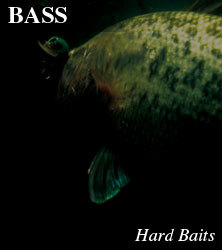 HIRA CRANK's flat side action brings fish to the bite even on calm water and areas without and cover. Jointed rolling action makes the most of its visual flickering effect. Overall volume is just right to bring on bites without hesitation. Nories emphasise on the baits potential borne from its action, shows in that the bait comes to life as soon as the retrieve starts. The fact that this lure doesn’t need a specialised rod makes this lures concept clear. It needs no unique methods, and can be used whenever necessary. HIRA CRANK unique visual wood crank bait, is one more tool for any angler targeting big bass.